An HR executive called me the other day and told me about this job where the employer had liked my profile, but (isn’t there always a but) he was wondering if I still had the “limitations” I did six months ago. Well, I thought of saying, that if you mean my kids, sure I still have them. They’ve grown a bit – my kids, I mean, not my limitations (paradoxically as kids grow, the “limitations”, sort-of, go down). So yes, I told him I am still a mother of three, but if it helps to know, the limitations now have full day school, so I am, you know, limitation-lesser, if you will. I wasn’t sure. I did tell him that things were a lot better than six months ago. I could now be at work from 9 to 4, which was not bad. Then I could carry work home, if needed, and stay longer when needed too. Sounded alright to me. He, however, did not receive my suggestions with the alacrity I had expected, and told me he’d call me back, which, I was quite certain, he would not ( I suspect he did expect me to come up with one of those wonder stories above). Many an HR agent/employer have been scared off before, so I am now quite used to it. I have even come to love the look in a prospective employer’s eyes when I say I have three kids. They have this uh-oh, holy-crap look. And I love to sit back and watch him/her get out of that one. It’s ace really, as David Mitchell would call it. Anyway, to my surprise, he called back. The employer, apparently, was alright with my flexi-timings (who said anything about flexi?) because he was running a start-up and he didn’t mind people working remotely (were you not listening, I didn’t say remotely!). The man had apparently expressed a wish to meet me. Great I said, I was willing and ready to meet. He responded with similar contrived positivity and got off the phone in a bit of a hurry. And so it was arranged. I wore my Sunday best and went to meet him on a Saturday (it’s a start-up, they don’t believe in weekends, but they are a “fun-place”. Right). It was a pleasant meeting and we spoke about this and that and the work, the profile and blah blah. I made all the right noises about my interest and abilities; he responded amicably, telling me all about entrepreneurship, finding talent, attrition and doing meaningful work. We parted well and I came home feeling quite satisfied. Then the HR fellow called me again. He too made the right noises about the guy liking my work and all the rest of it, but (there it is again) he was wondering about my issues. I didn’t say anything about my issues, I said. “Yes, but you had some limitations..”. I cut him off and told him that I had sorted those out – how and what was my problem. I suddenly realized the game that was being played – Flexi was euphemism for low-pay (it’s a start-up, duh). The penny dropped and I told the bugger that I was willing to go into the office everyday and stay late too (a part of me was going WHAT??? STOP NOW!) but I stifled any voice of reason in my head and caught the bull by its horns (lean in girl I told myself). Sheryl Sandberg’s face was now staring at me, right into mine. The truth is that while I was talking to him, the whole limitations crap finally got to me – when I realized that it was just a ploy to put me on the back foot while making me feel good about being able to work remotely! It turns out he does not even have enough space for me to come in to the office right now! He was trying to get me to say it first. But I didn’t. I just called the bluff and said I would do full-time, worry not. There was silence at the other end. This was not something he had been prepared for. He’d expected me to expand on my limitations, not make them disappear! But I had decided that even if it meant not getting on this bus (which I really wanted), I would stand my ground. Limitations my foot. Anyway, long story short, I he arranged another meet with the boss. I am supposed to meet the employer again in a few days. He wants to hire me, it seems, but also would like to “iron-out” some minor details. I am guessing these details would be about minors. I am a mother of three little girls (awww, I know) and I want to tell you a thing or two about them. No, it’s not my idea of a great pass time to write to companies extolling the virtues of my children (I’d do that on facebook if I ever became insane enough). I write to you because I think you need this unsolicited advice, because you don’t really know the kids you claim to make happy. You see, your blue-for-boys and pink-for-girls idea is a bit – how do I say this? nauseating. Not to mention, so clichéd and trite that it makes me wonder how companies like yours arrive at such regressive and frankly threadbare decisions. It makes me wonder if you even know children at all. Actually, I can quite safely say that you don’t, which is why I want to tell you a little about mine. Please do hear me out. My girls like pink, sure, but just as much as they like, say red, white, yellow and for that matter blue (surprise surprise). They play their doll games when they want, but they also like to cycle, run in the park, climb monkey ladders, swim, play tennis and build stuff, you know the kind you pack in the “for-boys” Kinder eggs – you do know the ones I am talking about? That’s right, those most predictably blue-coloured Kinder Eggs; the, you-must-like-large-eyed-fairies-because-you’re-a-girl and you-must-love-cars-because-you’re-a-boy, those ones. Seriously Kinder Joy? Pink and Blue? This is your idea? This is what creative-off sites in companies lead to? I mean, I may not be a marketing expert, but really this baffles and disgusts me at the same time. Selling chocolates by gender? Wow. Maybe it’s just me, but really, I am thinking why a company like yours would do this? Is it because you think that little girls would not like/ be interested in/ be able to put together a little puzzle or a want to play with a truck? That they would much rather have some fairy to pop out, which they can then take to their other similar minded friends (read girls) and proceed blithely into a soft-focus world of make-believe tea parties, which is where they belong? Because you think that building things is for boys, which, if your site is anything to go by, is what they do, with their dads by the way, because mommies would rather wear fitting tops and jog (yes, on your site too– them stock images, I tell you). Boys like to cycle wearing blue helmets and girls like to wear pink and kiss their mommies or hold soft and fluffy teddy bears. That’s your idea of kids (again, it’s on your site, do re-visit – all there). Telling images apart, there’s also a lot of politically-correct sounding rhetoric on your site. But here I am reminded of the age old saying – that actions speak louder than words – you make all these tall claims about raising happy kids and all the rest of it, and then you climb on to your self-made pulpit and tell them what they should play with. You girls there, here are your pink toys, now run along, be off, sit like little ladies in a corner and do your girlie stuff, whatever that is. 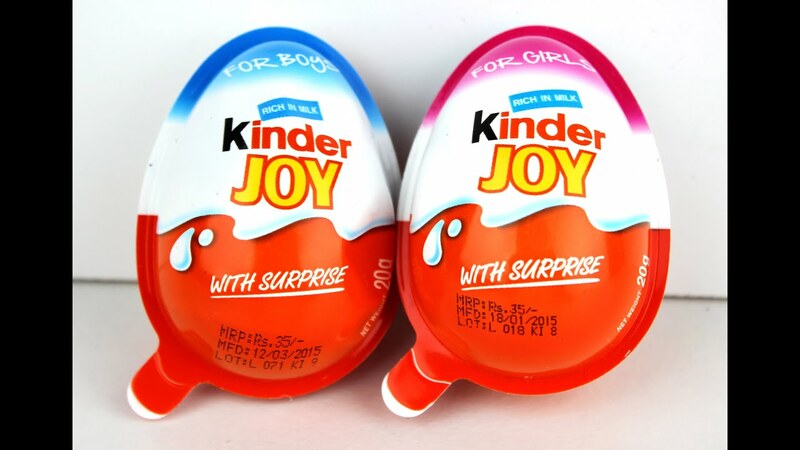 I want to ask you Kinder, who gave you the right to lure my child with a chocolate and tell her what her idea of a toy should be? Who gave you the authority to instill in her vulnerable little mind ideas about gender? Do you even realize what you are doing? Have you no feeling of responsibility towards the very children you claim to aid in raising happy? What I want to say to you is this – please look at children as children and not girls and boys on whose little backs you can ride all the way to the bank. You make chocolates all you want, but if you must club them with toys, do it responsibly. Go ahead, do your product re-launches, meet your quarterly targets and all the stuff companies do, but think of something better than this. It’s really a telling sign when someone like you feels the need to fall back upon the most overused and offensive stereotype in the world. I am sure you can do better Kinder. Give it a shot.